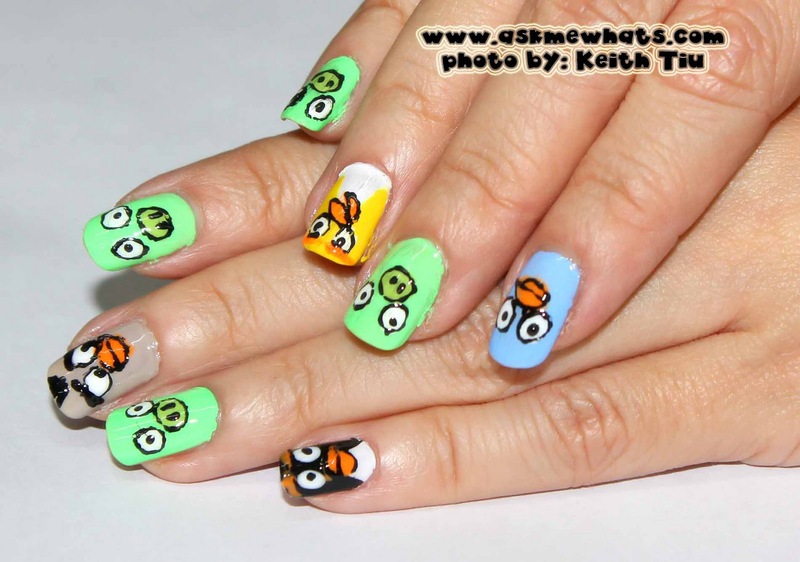 I guess I was searched by the Researcher of Kapuso Mo, Jessica Soho as I was contacted to feature my Angry Birds Nail Art on it's Angry Birds Video Game Craze Segment for July 2, 2011 Kapuso Mo, Jessica Soho episode. A closer look, that's the best screen shot I can get as I was wiggling my fingers as advised by the Segment Producer. **Both screen shots taken from YouTube Channel of DCRJPhilippines's. 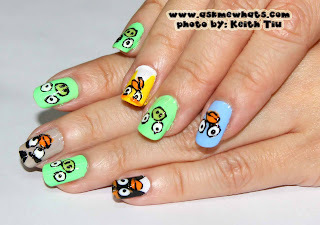 Here's a closer look on my Angry Birds Nail Art Part 2. I actually tweaked the design a bit! The placing of the characters are still the same But I've shown some heads and hair of the birds. For the pigs, I've added eyebrows, and some -- helmet! Let's check out our favorite Red Angry Bird getting its revenge to the scared pig! 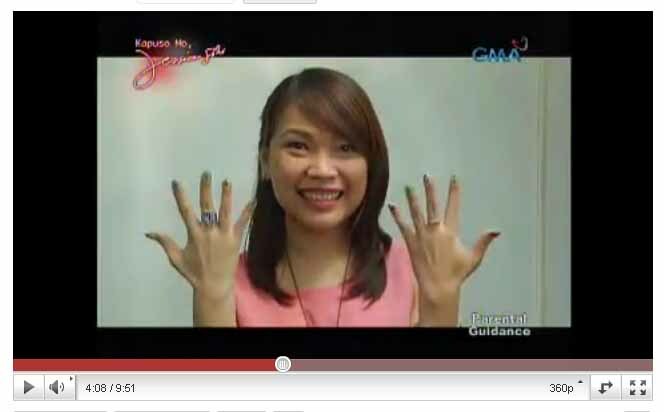 I want to thank Romabell, Segment Producer for Kapuso Mo, Jessica Soho and 2 cameramen for making me feel comfortable! It's difficult to re-do my nail art design in front of the camera but I survived! (Thanking Mags and Shanna for the vote of confidence too). Oh, I will share nail related "happiness" which I got to include in my nail addiction collection! 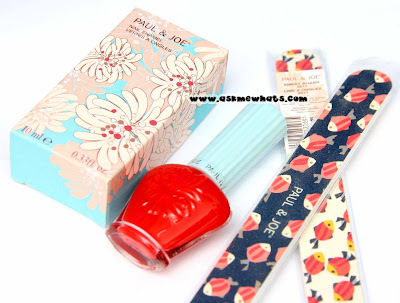 Paul & Joe Nail Enamel in Bright Red and 2 cute Nail Files. I don't even know if I'll have the heart to use it! Have a gorgeous Monday ahead! I want to thank everyone who watched the short segment and congratulated me on it! THANK YOU! Ang cute mo sa screenshot lau ee!!! LOVE IT!!! i wonder if we have the same cameraman!!! yung nagpawiggle din ng fingers ko when i was featured din in KMJS!!! ang difference lang natin, you're cute doing that, ako nevermind LOL! once again, i am so so proud of u sis!!! :D :D u totally deserve it! You look so cute and happy in your screenshot! Congrats Achi Nikki! Congratz!...ang galing mo Ate!...Keep it up! So cute! Congrats, you deserve it! I watched your segment, too. LOL. It was so cute. Awww.. I can't draw. I can't make angry birds nails. wow, ms. nikki you actually got featured on national television! how nice for you. sayang i didn't get to watch it. @The Perpetrator Yes, you are right, I actually do that, especially when I'm bored too! congrats Nikki! 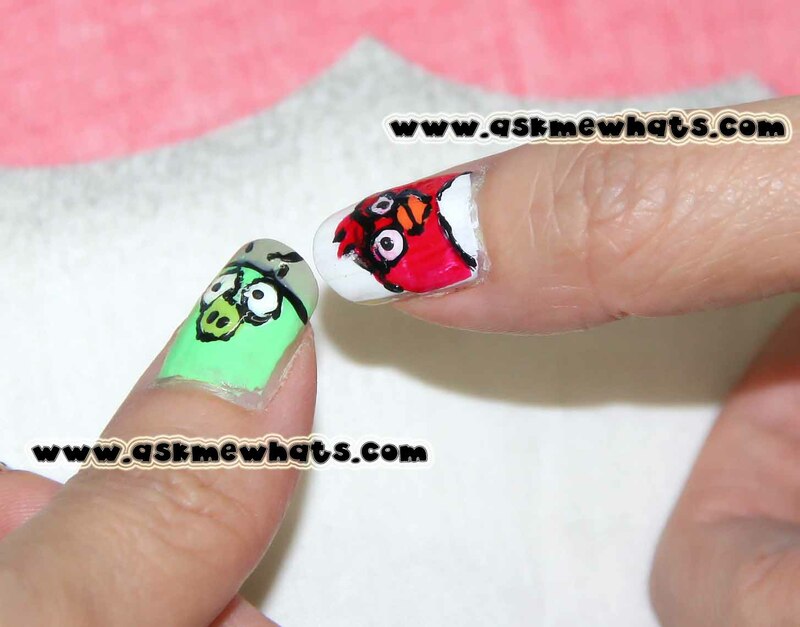 love your blog and your nail arts! @grace Thank you so much Grace for the well wishes!